On 7th February (26th January - Julian Calendar) 1807, the Russian Army was retreating from the town of Landsberg (today Gozuv-Velikopolski, Poland) to Preussisch-Eylau (today Bagrationovsk, Kaliningrad province of Russia) where the Commander-in-Chief, General Bennigsen, decided to fight a decisive battle with Napoleon. The rearguard covering this march was commanded by Major General Prince Bagration. His mission was to give Russian Army an opportunity to withdraw and take up a position behind Eylau. This detachment was temporary formed with regiments from different divisions. Therefore it is hard to say anything with confidence about it's organization. One hour after dawn (about 9 AM), the rearguard left Landsberg and reached the woods that spread between Landsberg and Eylau. Because they were operating in the wood, Bagration left all his cavalry and a part of his artillery in the rear. The jager regiments (4th, 5th, 7th, 25th) were brought together, and supported by musketeers, fought effectively until 11:00 a.m. Because of the extremely difficult winter conditions, the retreating Army was compelled to get rid of "weights"; and so, about 11:00 a.m., among the abandoned property, the jagers found barrels of vodka. The soldiers were tired, hungry, and cold; and the alcohol was free! Soon the jager regiments became drunk. The French, having noticed confusion among Russians, increased the pressure with their skirmishers. The Russian horse artillery, commanded by Colonel Ermolov and the hussars under Major Generals Palen and Lambert (presumably, Sumsky and Alexandriysky Hussar regiments) had to be used to rescue the drunk jagers. Despite their efforts, many soldiers were taken prisoners. 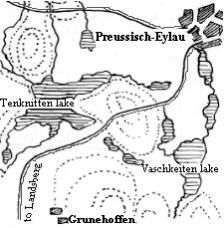 At last, rearguard's regiments took up a position in front of Eylau on the hill between two lakes - Tenknitten and Vaschkeiten. This position was 3/4 miles before Eylau and 1 mile beyond the village of Grunehoffen. By holding it Bagration could covered passage of the Army's heavy artillery through the town. The Moskovsky Grenadiers and the 24th Jagers Regiments were sent to support the rearguard. (Perhaps, some musketeers from 8th Division were also sent as a reserve.) Because all of rearguard's cavalry were engaged and needing some more, Bagration sent his adjutant, D.Davydov to the Commander-in-Chief to ask for more cavalry. Bennigsen let Davydov take any two regiments, that had not deployed yet onto their positions. As a result, Davydov brought to Bagration the Saint-Petersburg Dragoons and the Litovsky Horse Regiment (the prototype of Uhlans); and a bit later the Kargopolsky and Ingermanlandsky Dragoons and His Majesty Cuirassiers. Bagration deployed his troops as following: Pskovsky and Sofiysky Musketeer regiments (under Major General Markov) in the first line with Ermolov's Horse battery (14 guns) on their left flank; the Moskovsky Grenadiers led by their commander, Prince Karl Meklenbourg and the 24th Jagers were in the second line. The cavalry were moved to the flanks. It is difficult to say where the drunk Jager regiments were positioned, however they obviously did not participate in facing the first French assault. At about 2 o'clock in the afternoon, the French advance-guard moved on to the Russians' position in three columns being led by a skirmish line of light cavalry. The central and the foremost column was the 46th Line Regiment. It marched on slowly through the deep snow, "l'arme au bras". The column was under fire from Ermolov's artillery and the skirmishers of the Pskovsky Musketeers, who were laying on the bottom of the hill. Along the road from Landsberg, which led to the Russians' right flank, behind and to the left of 46th, the 18th Line Regiment was marching conducted by Brigade General Lavasseur. The third French column (possibly the 24th Light) marched against the Russians' left. that was saved. Everybody was depressed by the loss of the flag"(8). As a result of this brillant cavalry charge, the Eagle of 2nd Battalion of the 18th Line Regiment was taken, 35 French officers killed, 9 wounded including General Lavasseur; more then 500 men were killed, wounded, or taken prisoners. The Saint-Petersburg Dragoons lost 2 officers and 18 troopers killed, 2 officers and 16 troopers wounded. Meanwhile the third French column, that threatened Russians' left flank was stopped and turned back by grapeshot from Ermolov's battery. The French fell back to the village of Grunehoffen and an artillery duel started in which French were more successful due to their larger calibre. In about 1/2 hour other units of Soult's Corps and some units of Augereau's came up to Grunehoffen and the French assumed the offensive again. Augereau's cavalry (7th and 20th Chasseurs) fought against the Kargopolsky and Ingermanlandsky Dragoons, His Majesty's Cuirassiers and the Elisavetgradsky Hussars on the ice of the frozen Tenknitten lake on the Russians' right. The Pskovsky and Sofiysky Musketeers left their position for Eylau while Moskovsky Grenadiers and 24th Jagers moved into the center of the first line, Soult's forces on the Russians' left flank were held by the artillery and the Izumsky Hussars. The Hussars drove the French skirmishers back, so that the latter were forced to huddle into small groups from their formerly extended formation. Presumably, the Jager regiments had sobered up and joined the battle. As the French forces increased, all units of Russian rearguard were involved in the combat. The French pressed on using with a large number of columns and began to outflank the Russians. There was no way for Bagration to hold the position. As all the heavy artillery had already passed through the town, Bennigsen ordered the rearguard to withdraw through the town. Eylau itself was held by another rearguard detachment under Major General Barclay de Tolly. Another heavy combat in the town was forthcoming, but this rearguard action by Bagration allowed the Russian Army to deploy behind Eylau and prepare for the next day's battle. Andolenko, C.R. "Les Aigles d'Eylau" Aigles de Napoleon contre Drapeaux du Tsar Paris;1969. Acknowledgements: Author thanks Alexander Lukirsky for the help with the sources. Placed on the Napoleon Series: March 2000.